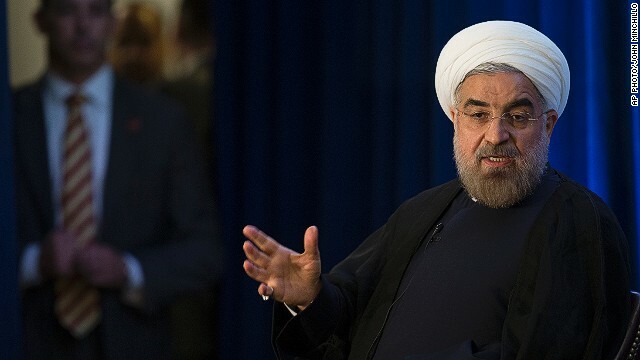 Washington (CNN) - A majority of Americans support an interim deal with Iran that would ease some economic sanctions on that country in exchange for concessions on Iran's nuclear program, according to a new national poll. Three days of intense negotiations earlier this month in Switzerland between Iran and the U.S., Russia, China, Great Britain, France, and Germany concluded without an agreement which would roll back some punitive measures against Iran in exchange for measures assuring that the Middle Eastern country isn't developing a nuclear weapon. Talks resumed Wednesday. Secretary of State John Kerry said Wednesday that all sides are closer than they've been in a long time on a nuclear deal. But he stressed it hasn't been reached yet. The proposal has met significant resistance. Israeli leaders and some in Congress have voiced opposition, saying leaders in Tehran cannot be trusted. On Tuesday, a bipartisan group of six senators urged the administration to reject the proposed deal with Iran and accept only an agreement that better dismantles Iran's ability to develop nuclear weapons. The poll was conducted Nov. 18-20 for CNN by ORC International, with 843 adult Americans questioned by telephone. The survey's overall sampling error is plus or minus 3.5 percentage points. Iran did not, is not, and will definitely not stop its nuclear weapon program. Anyone thinks otherwise does not know terror of shia isalm. Most don't even understand it. Look at these posts, does it look like anyong is informed? You're a fool if you think Iran is going to give up nukes. This is just another stall. Let Israel fight it's own wars!!! They are NOT a theat to the United States. The Iranian government is working with us and we shouldn't do anything as long as they are listening to us. Iran also doesn't have a problem with Jewish people it's Israel's government it has a problem with. Iran has 20,000 Persian Jews living in the country and they have the right to practice their religion. About ten years ago there were about 60,000 Jews in Iran. I'm sure many left bcz they are afraid of Israel bombing them. Also there are many Jews who are against the Zionist government of Israel. "Why not just wait and observe?" Because the goal of sanctions is not to collapse Iran's economy and thereby cause suffering for millions of innocent civilians who will hate us for it and raise their children to hate us for it. The goal of sanctions is not to destroy Iran or bring them to their knees and send them back to the stone ages such that we can just order them unilaterally to do whatever we want. If you think any of that is the goal of sanctions or, even more basically, is a legitimate goal at all, then you truly haven't the first clue about diplomacy. I'm curious if those polled that are in favor are in favor of *a* deal that would impose hypothetical restrictions, or *this* deal. I'll admit I'm in favor of *a* deal that would *hypothetical* restrictions, but haven't heard anything about this to know if *this* deal event attempts to impose the right restrictions, and even assuming it does, has the teeth to actualy enforce them. The six nations are wasting their time. The only purpose that the regime of mullahs in Iran could possibly have for their nuclear program is to strengthen their grasp of power, internally, regionally, and internationally. When the regime’s representatives or authorities talk about “medical” purposes, one should ask them since when the health and well-being of the Iranian masses have become so important to the regime? In the City of Ahwaz, more than 1,000 people go to hospitals every time it rains, because of all the acid vapor floating in the air. People are dying left and right in the slums of Tehran and other cities because of the lack of hygiene and medical care. Hundreds of thousands of detained people are suffering in the jails of Iran because of the lack of hygiene and medical care. Major rivers and lakes have been dried because no authority cares about the environmental and health implications of diverting their water for “industrial” use, but all of a sudden “cancer treatment” by radiation has gotten so much priority that the regime jeopardizes the safety of the whole country to “internally produce” uranium (and plutonium too!) for medical purposes! The excuse of “internally producing rods” for the nuclear power plants has several holes in it too. How much rods would they need? And wouldn’t it be much more economical and much safer to purchase the rods from producers? Wouldn’t Russia or China sell those to Iran, if not the western countries? And if the purpose is peaceful only, why so much lack of transparency? Let's just bomb them for Israel. A total farce! You might as well take a poll of Americans as to what is the best technology to use to get to Mars. How many Americans can even find Iran on a map? How many have ever negotiated with a fanatical regime? How many have had any experience enforcing international agreements on a diplomatic level? How many Americans have any idea how a nuclear reactor works or how an atomic bomb is constructed? The answers given in such a poll are controlled by how the questions were asked and the population's total ignorance of the complexity of the problems. A total farce! You might as well take a poll of Americans as to what is the best technology to use to get to Mars. How many Americans can even find Iran on a map?